This hop brings me back to why I originally started a blog. 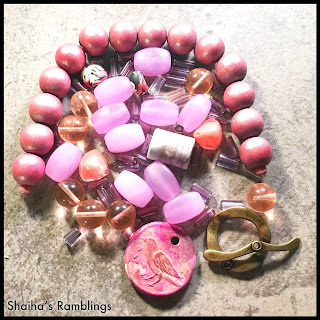 Back in the day there were several 'blog hops' where designers would create around a theme or in this case with beads that were sent to us by a partner. I really want to thank Linda Anderson for continuing on the tradition. My partner this time around is Fay Wolfenden of Torch Fairy. I have to say that she has been a wonderful partner especially considering that I have been having issues with my health since the beginning of the year. 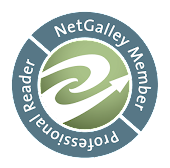 I haven't been able to spend near as much time posting as I have wanted with the exception of the book reviews which I have been able to do on my iPad. Now of course I sent her goodies and being me I couldn't make up my mind so I sent a couple different batches. Hopefully this will make up for me not being chatty and posting a lot. This first batch includes a porcelain focal from Andrew Thornton of Allegory Gallery. The second batch is in cooler colors. This batch includes a focal from Linda Landig and one from Fanciful Designs. 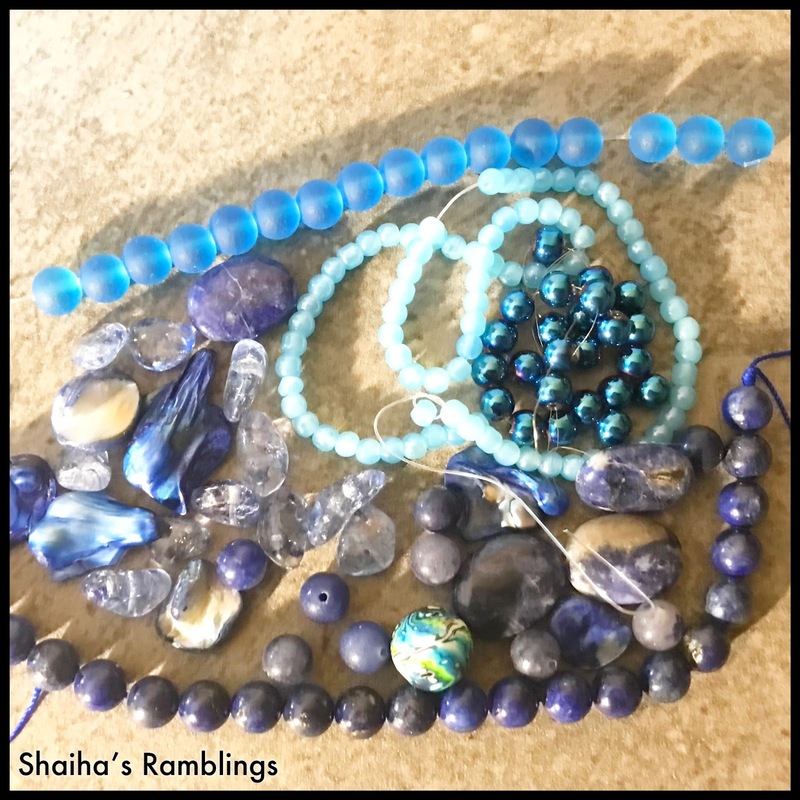 There are also supporting beads. 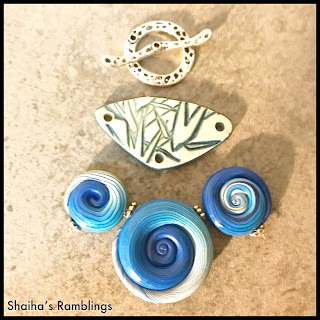 My end goal with these selections was to share my love of ceramic and polymer focals since Fay is a lampwork artist. Now I knew that unless something improved I wouldn't have a lot of time upright to work on my jewelry so I wanted to challenge myself. 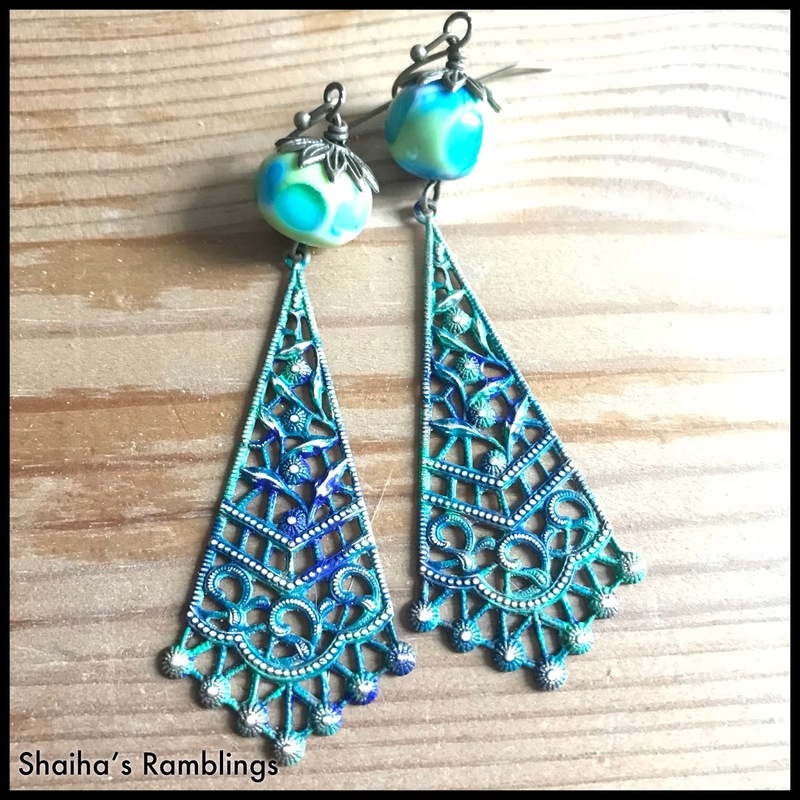 I know that earrings can be quick and easy for some but they always stump me. I don't want to limit myself to such a small canvas but that was my challenge. On the first pair, I took some of the lovely lampwork beads that Fay made and combined them with some filigree drops that I added some patina to. They are lightweight and ones that I will be keeping for myself. Perfect for summer. 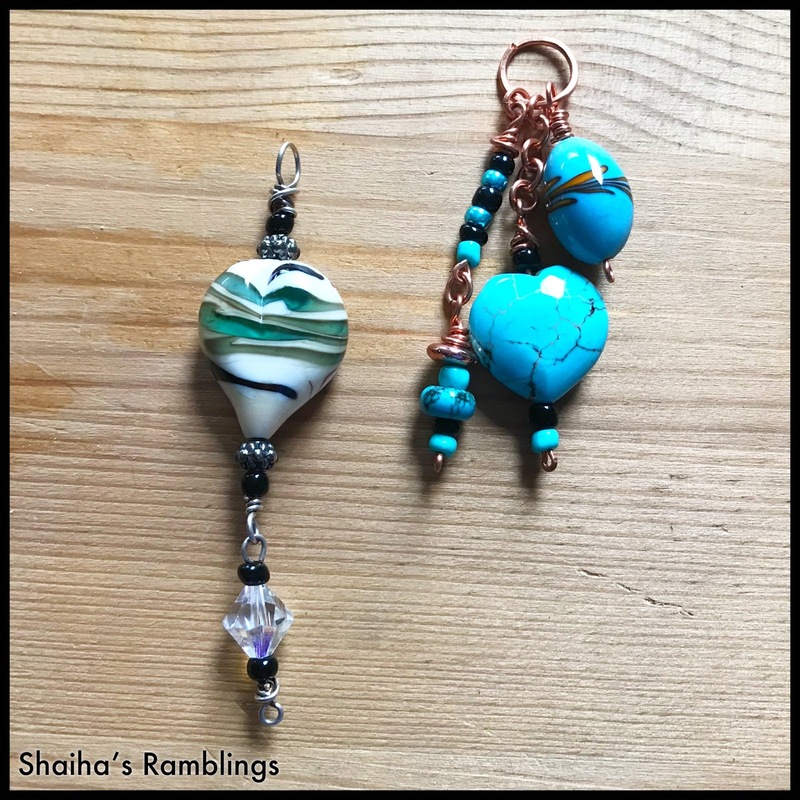 The second pair I made by pairing up some more of Fay's beads with drops from Scorched Earth. Those I will get added to my shop. Now onto the main show. 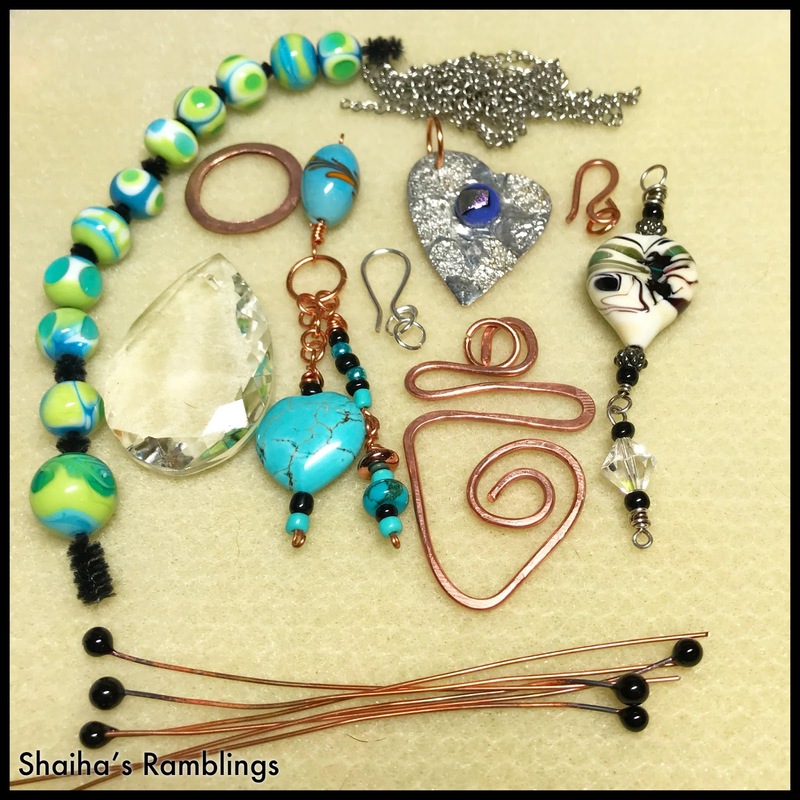 I just loved the dangles that Fay sent along so I didn't want to take them apart. Besides they will hang beautifully from the charm holder. Making this necklace was actually more complicated then I thought it would be. I tried several different chains and weren't happy with them so I am so glad that the hop was delayed a bit. 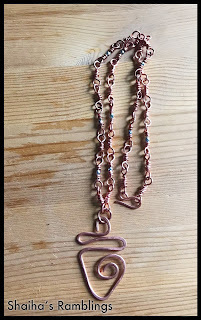 I ended up making my own chain using copper wire and silver beads. And now I have a necklace that is definitely mine that I can personalize with different charms. 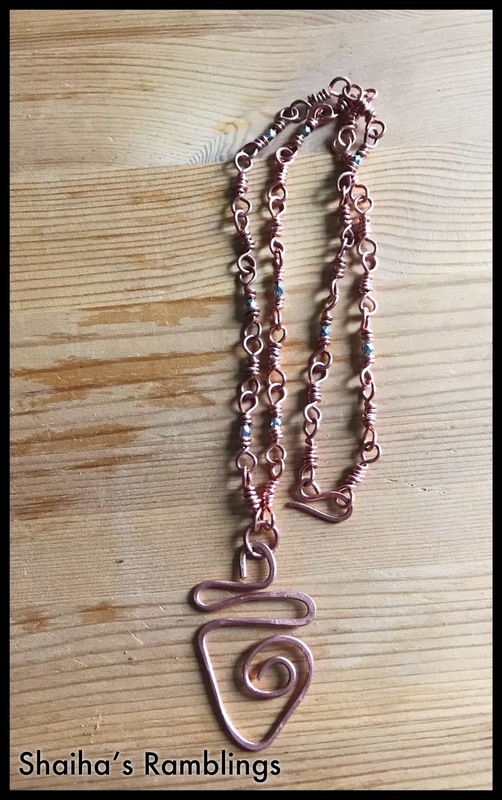 Thank you so much for sending along the copper hanger. Now since this is a hop, make sure that you check out what everyone has made. There is this wonderful list of designers that joined in but I can't figure out how to copy it. Yeah I am gradually learning my way around this operating system. Anyways to be able to check out everyone's designs be sure to click here. It will take you to our hostess's page and the links for everyone. A great earrings and necklace. I love the chain you made. 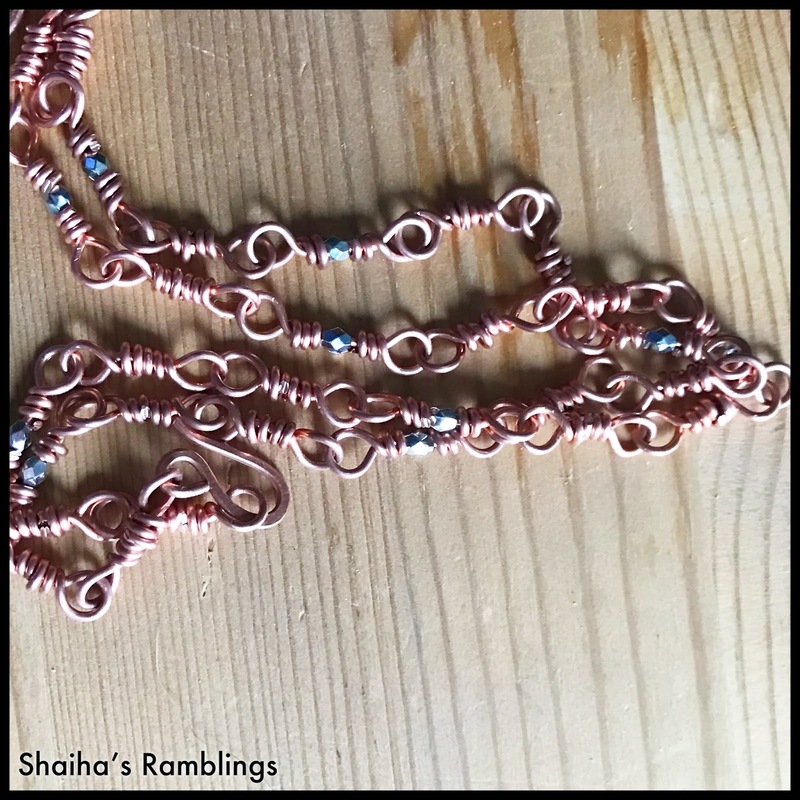 That chain is gorgeous and goes nicely with the charm holder with the charms your partner made. Nice job! The earrings are fantastic! love the elements in each pair you chose to perfectly compliment Fay's beautiful beads. The necklace is of course fabulous and will be so much fun changing out charms...a perfect talisman holder for whatever you need at the time. Beautiful! That handmade chain is amazing! I hate to hear you've been so sick, but am glad that you were well enough to participate some. It wouldn't be the same without you. Your earrings are lovely, but that necklace is what really steals the show. 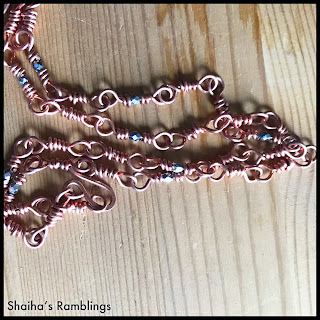 I like how you used the silver beads with the copper to create a mixed-metal look, ensuring that it will go with a variety of charms and outfits. Here's hoping you get well soon! Love that handmade chain. It's perfect with the charm holder. These are really Lovely designs!! I Love the chain you made too!!! Great Job! Be Blessed!!! 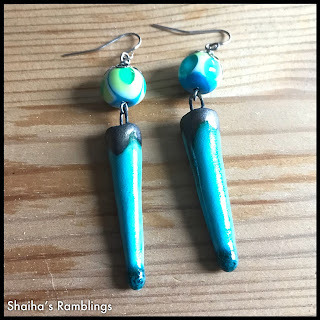 Hi Shai, The first pair of earrings is right up my alley. The chain that you made is AWESOME! I really like that you can swap out the charms so it looks different every time you wear it.That necklace is simple but so effective. Your earrings are adorable. I really love the chain that you made! I like the earrings - beautiful colors and dangles, good job on coloring the filigrees! 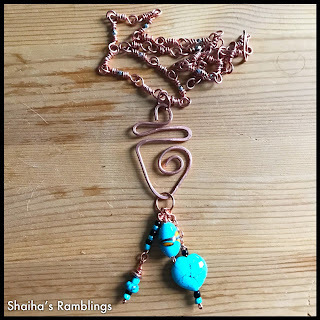 The necklace is gorgeous - I've been making bracelets with these wire wrapped links and now I see that they're perfect for a longer chain! Fabulous idea about interchangeable dangles! The chain necklace that you made is wonderful. I love the focal and the beads added to it. You did a great job in creating this special piece. Well done! Oh my goodness! What a GORGEOUS collection of pieces! I'm CRAZY about the piece you made the chain for, with the charm holder. That's BRILLIANT in all kinda ways - besides the design and the quirkiness of it, I love the idea of hanging charms from it. Just so DARLING! 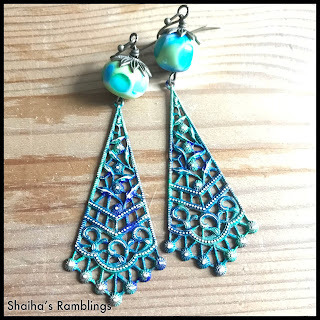 And I love the earrings with the patina'd filigree. I LOVE me some patinas =) BEAUTIFUL work!